Online dating sites in Chile remind me a lot of online dating sites in Argentina. Don’t expect to find a large number of single men and women to choose from as is the case for countries like Colombia and Peru. Online dating in Chile hasn’t really taken off, and people still choose to meet their romantic partners via the traditional methods of mutual friends, organizations, work, school, or church, etc. I think as time goes on, online dating will grow in Chile, but it will be gradually. If you are a lonely expatriate or foreigner in search of someone to date in Chile, either offline or online, make sure you concentrate your time in Santiago which has the largest pool of singles in the country. Signing up for the sites below and putting in a lot of work on your part, you might have success in Chile. As they say, you reap what you sow. So start sowing those seeds so that you can eventually enjoy the fruits of your labor. Without further ado, here is the quick list of the top two best dating sites in Chile. I’ll go into more detail in my reviews below. While Dominicans and Colombians seem to dominate Latin American Cupid, it is still pretty good for those looking for love in Chile. A simple search of women 21-35 who live in Chile will turn up a considerable number of profiles. The selection of women and men on this site is not near what you will find at the site I mention below, but the quality is much better. I also really like the easy-to-use interface. Latin American Cupid seems to have a lot of men and women on the site living in Santiago, so, if you are going to use this site, Santiago seems like your best city for attaining success. If you’re interested in signing up for Latin American Cupid, check out my full write-up on the site over on my review of the best dating sites in Argentina. 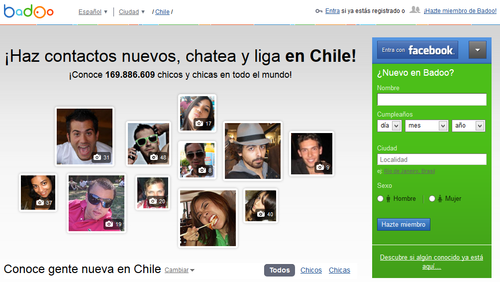 Badoo is a last resort option for Chile. On face value, if you do a search of let’s say, women between 25 and 35 years old, you will turn up a lot of women in your search results. The problem with Badoo though is that you will have to weed through a lot of low quality/fake profiles in order to locate real people. The quality is just not as good as you will find on Latin American Cupid although the selection is a lot larger. Because of my issues with the quality of profiles on Badoo, I would not focus on it as a starting point for my dating search. If you’re interested in signing up for Badoo, check out my full write-up on the site over on my review of the best dating sites in Argentina.